Cost: Non-Members - $30 Members/Gold Members - Free If you'd like to become a member go to https://iereic.org/membership/ Payment: Payment may be paid at the door. We gladly accept cash and credit cards. No checks please. Parking: The Mission Inn Hotel offers valet at the entrance on the south side of the hotel. The self parking garage on 6th Street is available at an hourly rate. There is plenty of parking on the street. All street parking is free after 5PM. Bring your business cards and flyers to share and drop on the back table! Don't be a "secret-agent" -- we all want to know who you are and what you do! ------------------------------------- Location: Glenwood Tavern 5:00 PM - 6:00 PM Members Only Networking - Members and Gold Members are invited to network and have a drink or two on us before the event. --------------------------------------- Location: Grand Parisian Ballroom 6:00 PM - 7:00 PM Open Networking/Mentor Sessions - If this is your first time attending an IEREIC meeting, we've made it easy for you to get your feet wet. We realize networking is scary for most people so we've got a plan to keep you from staring at your phone. Along the back of the room you'll see pub tables with our mentors hanging our around them. Look for their special designated name tags. They're here to help you get started and help you meet people at the club. If you're a regular, look for the people starring at their phone. Introduce yourself and help them get comfortable. 7:00 PM - 7:15 PM Opening Remarks - Stephen and Todd (hosts) will spend the first 15 minutes getting to know the crowd, making announcements, and doing their best dad jokes. 7:15 PM - 7:30 PM Accolades - Every month a few individuals stand out. Someone buys their first deal, quits their job, makes their first offer, even lends someone money for the first time. The is when we recognize those people who took action and made an uncomfortable leap in the real estate investing realm. 7:30 PM - 8:00 PM Haves and Wants - The last segment of the first half is an opportunity to tell the audience about that deal you've got for sale or the money you're looking to place in someone else's deal. Maybe you're looking for a specific type of property or need a contractor. Grab a haves and wants sheet from the check in desk and we'll hand you the mic for 30 seconds to tell us all about it. Presenting at have's and want's is limited to members only. 8:00 PM - 8:15 PM Intermission - We'll take a 15 minute networking break to setup for the interview. If you find your conversation running long after haves and wants, please move into the hotel lobby or bar. 8:15 PM - 9:15 PM Q&A with guest speaker - Every month we strive to find someone that's actively working in the real estate investment industry. You wont find professional sales people with expensive courses at our event. 8:50 PM - 9:00 PM Closing Remarks - It's really just a long goodbye. ----------------------------------------- Location: Presidential Lounge 9:20 PM - 11:59PM Late night with IEREIC - After every event we break down the equipment and head to the Presidential Lounge in the Mission Inn for late night networking and story telling. Join us. This is where the relationships are truly built and deals are made. The fastest way to learn a language is to immerse yourself in the culture. The language of real estate investing is no different. Now you can work next to other successful real estate investors like Stephen Mckee and Todd Bayer at CRG, Ryan Raven and Thomas Chappell at Rehab Loan Group, Charlie hustle and the team at Home Owners Resource group. 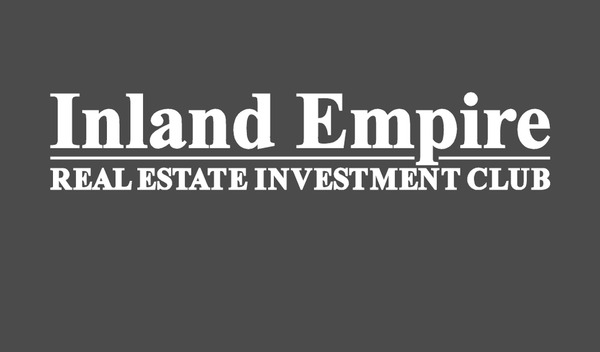 The Inland Empire Real Estate Investment Club now has it's own clubhouse. The IEREIC Clubhouse is located in historic downtown Riverside, directly across the street from the Mission Inn. It features 12 semi-private offices with 24 hour access, the Deal Makers Lounge, high speed internet, laser printer, mail and package handling, a business address, regular cleaning service, and a motivating, success driven environment for only $250 a month. Come by April 26th and grab one of the last 7 spots to kick your career into overdrive. Do you have a real estate related deal in or around the Inland Empire? Are they Buy and holds, flips or Multifamily? Are you looking for funding or a partner to join you in your venture? If so then this is the meeting that you've been waiting for. Join us on the 2nd Wednesday of every month for our new meeting "Let's make a deal"! Our goal is to put together your deal right in the room. We will let you share your deal in a "Shark Tank-Style" presentation where you will get feedback and recommendations from the audience and your hosts: Todd Bayer, Stephen Mckee and Ryan Raven. Do you already have a deal that you would like to present? Message Joanna on Meetup with the details and we will have it ready to be reviewed at the meeting (deals may also be presented the day of the event). Coffee, tea and water will be provided. Agenda: 6:00pm-7:00pm: Open Networking 7:00pm-8:00pm: Lets make a deal "Shark tank-style" presentation time where you can share your deals with the audience. Let's put your deal together tonight! 8:00pm-8:20pm: Intermission 8:00pm-9:00pm: Round Table discussion. This is your time to voice your concerns, questions or comments. 9:00pm: Event End.